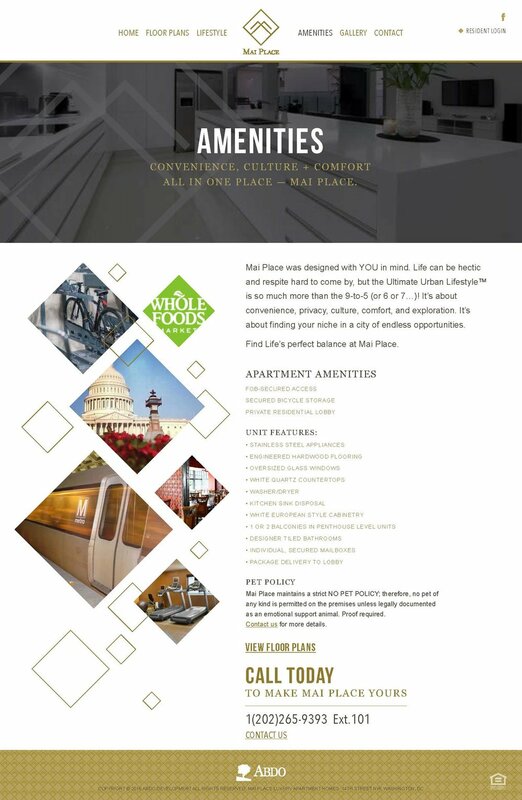 Take up residence in the heart of the action, where 14th Street and Rhode Island Avenue intersect at the doorstep of DC’s hottest new luxury apartments—Mai Place. Inspired by blueprint drawings, the Mai Place logo showcases an aerial, abstract perspective of a resident’s living space. Using a strictly linear approach, the lines ("rooms") converge to form the letter “m”. It’s no secret you love DC; she’s been good to you. And you work tirelessly day in and day out to realize your dreams while still squeezing in a few hours here and there to experience your city’s many historic passions and culinary prestige. Save time and experience even more at Mai Place. Say goodbye to the absurdly long taxi rides that make you sweat your reservation at Le Diplomate or the inevitable struggle to find parking near Studio Theatre. Mai Place gives you access to DC’s hottest spots within steps of your home. The 14th Street corridor embraces DC’s diverse culture through live theatre, boutiques, art galleries, and a glorious spread of eclectic restaurants.